What a slugfest that just took place at Ford Field in Detroit between the San Francisco 49ers and the hometown Lions, who came into the game undefeated. This was a game between two teams who no one expected to have the records they did when they entered this game. Definitely the two surprise teams of the season, these teams did not disappoint, as they went back and forth, defenses played hard, offenses stuck to their strengths and in the end the 49ers stood tall and handed Detroit its first loss of the season with a 25-19 win. The game was very close in score and yards gained as San Fran had 314 yards and Detroit had 310, but what wasn’t close was how these teams got to those totals. San Francisco stuck with their bruising run game spearheaded by Fran k Gore, who had 141 yards on 15 carries, and had a touchdown. Kendall Hunter had 33 yards on 8 carries. In total the 49ers had 203 yards rushing, but Alex Smith helped out too as he was 17/32 for 111 yards and a touchdown. For Detroit the passing attack was the main strength of the offense as always, as Matt Stafford was 28/50 for 244 yards and two touchdowns. Calvin Johnson had 7 catches for 113 yards and for the first time this season didn’t have a touchdown catch. The difference for Detroit is they didn’t have balance on offense as they only had 66 yards rushing, and while I know running isn’t a huge part of the offense for Detroit, if they get to 100 yards today they probably come out still undefeated. Jahvid Best led the Lions in rushing with 12 carries for 37 yards. Both defenses played extremely well as you would expect now from these two teams. Both defenses only allowed the opposing offense to convert two third downs. Detroit’s defense however won the turnover battle 2-0, the first coming on San Francisco’s first play of the game when Kyle Vanden Bosch beat Joe Staley and strip sacked Alex Smith and recovered the fumble. In the end though the 49ers defense was able to hold the powerful Lions offense in check, and was able to rattle Matt Stafford enough to keep him from completing passes. 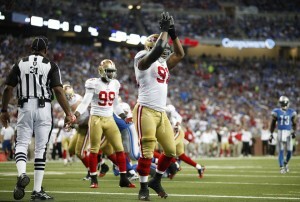 This game may go a long way to sending a message to the rest of the NFC, that the 49ers are ready to take on all comers. While they were penalized 15 times, they still managed to pull out the win. The 49ers stand tall atop the NFC West division and it looks like no team in the West has what it takes to surpass them from here on out. The 49ers who have played 3 of the past 4 games in the eastern time zone, now get to return home to play the Cleveland Browns. Be the first to comment on "49ers Win Slugfest in Detroit 25-19"